By John Magulick, M.D., Kevin Steel, D.O. This is a case of a 62-year-old woman status post wedge resection of the liver, right hemicolectomy, and resection of the terminal ileum for metastatic carcinoid tumor arising in the terminal ileum. She also had regional mesenteric lymph node involvement. After resection, she continued to have elevated chromogranin A levels, as well as occasional flushing and diarrhea which progressed to gastroparesis and episodes of fainting. A detailed cardiac workup revealed no significant findings on echocardiogram, nuclear medicine stress test, or holter monitoring. Further evaluation with octreoscan revealed a small focus of abnormal uptake adjacent to the left atrial appendage. 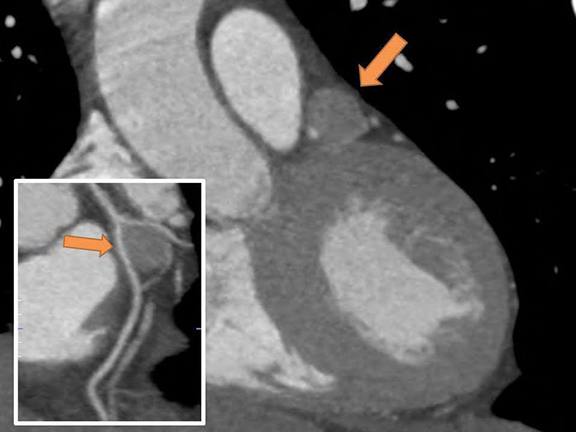 The patient subsequently underwent a gated cardiac CT, which revealed a 1.5 cm soft tissue mass splaying the left anterior descending artery and first diagonal branch of the coronary arteries (arrows). After resection of the cardiac lesion, the patient continued to report occasional flushing with resolution of diarrhea, gastrointestinal, and systemic symptoms. Carcinoid is a neuroendocrine tumor which most often occurs in the gastrointestinal tract or bronchopulmonary tree. Metastatic disease is common; in the abdomen, there may be regional spread to lymph nodes or hematogenous spread with distant metastases. Regional mesenteric spread often leads to desmoplastic or fibrotic changes in the abdomen. The liver is the most common site of hematogenous spread. Hepatic metastases are typically hypervascular on contrast-enhanced studies. 111In-octreoscan is a useful adjunct, since carcinoid deposits may be readily identified as regions of increased uptake. Magulick J, Steel K. At the Viewbox: Metastatic Carcinoid Tumor. J Am Osteopath Coll Radiol. 2013;2(2):28. John Magulick, M.D., Kevin Steel, D.O. Dr. Magulick works with the Department of Medicine, San Antonio Military Medical Center, San Antonio, TX and Dr. Steel works with the Department of Cardiology, San Antonio Military Medical Center, San Antonio, TX.